Luckily for us, there is a wide choice of contact lenses available for those with keratoconus. Fitting contact lenses on a keratoconic cornea is challenging and time-consuming. You can expect plenty of return visits to fine-tune the fit and the prescription, especially if the keratoconus continues to progress. It’s very unlikely that any lens will fit first time, so patience and perseverance is key. Recently, contact lens manufacturers have introduced custom soft contact lenses specially designed to correct mild-to-moderate keratoconus. These lenses are made-to-order based on detailed measurements of the keratoconic eye(s) and can be more comfortable than gas permeable (GP) or hybrid contact lenses for some wearers. 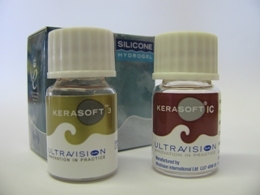 KeraSoft by Bausch & Lomb lenses can correct up to -30 diopters (D) of myopia and up to -15 D of astigmatism and are available in silicone hydrogel and regular hydrogel materials with high water content (74 to 77 percent). Kerasoft lens are great for early stage Keratoconus and also post graft eyes. KeraSoft IC lenses are designed to fit irregular corneas, including keratoconus, post laser refractive surgery, pellucid marginal degeneration, and other corneal irregularities. Each KeraSoft IC lens is custom-made for your exact needs, and KeraSoft IC lenses can offer increased wear time and improved comfort and are a patented combination of the latest technologies in silicone hydrogel materials using geometries from complex mathematics to offer comfortable wear and excellent vision. NovaKone lenses (Alden Optical) can correct up to -30 D of myopia and up to -10 D of astigmatism and are available in a hydrogel material with medium water content (54 percent). Both lenses have a very wide range of fitting parameters for a customized fit and are larger in diameter than regular soft lenses for greater stability on a keratoconic eye. In a recent study of the visual performance of toric soft contacts and rigid gas permeable lenses for the correction of mild keratoconus, though GP lenses provided better visual acuity in low-contrast situations, soft toric lenses performed equally well in high-contrast acuity testing. Custom soft toric lenses also can be a good option for part-time wear for people with keratoconus who cannot tolerate wearing gas permeable lenses full-time. ClearKone® hybrid contact lenses offer all the benefits of rigid gas permeable (RGP) and soft contact lenses without any of the disadvantages for an overall good contact lens experience. ClearKone® is an NHS approved and FDA-cleared hybrid contact lens specifically designed for the treatment of keratoconus and other corneal irregularities. Using a revolutionary technology, ClearKone® combines the best of both worlds – the crisp vision of a high-oxygen rigid RGP contact lens with the all-day comfort and convenience of a soft lens. ClearKone® is specifically designed to restore vision to patients with the many types and stages of keratoconus, including post graft lens wear. Because the ClearKone® lens vaults over the cornea, there’s minimal risk of corneal scarring, making ClearKone® hybrid contact lenses a healthy treatment option for keratoconus. In addition, the soft skirt of the ClearKone® design helps to center the contact lens over the visual axis regardless of where the cone is located on the cornea or how large it is, thereby decreasing visual distortions and providing superior vision. The ClearKone® design also prevents dirt from getting under the lens and will not pop out unexpectedly. Hybrids use soft lens cleaning solutions. UltraHealth, available in 2013, from Synergeyes, is the only irregular cornea hybrid contact lens with highly breathable, healthy materials and an advanced lens design especially suited for patients with irregular cornea conditions. UltraHealth corrects vision problems, is healthy for your eyes and delivers exceptional comfort, too. UltraHealth delivers vision benefits only available in hybrid contact lenses. The “rigid” (GP) material optimizes vision; while the soft skirt centers the lens over the cornea, providing enhanced stability and clarity. The soft silicone hydrogel material that surrounds the GP portion of the lens provides longer-lasting comfort for irregular cornea and keratoconus patients. UltraHealth is made with materials that allow very high oxygen transmission. The lens design also promotes tear circulation throughout the day, which delivers even more oxygen to the eye. 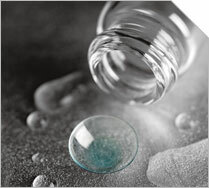 The launch in France of the first range of Hybrid Contact Lenses, combining quality of vision with rigid lens wearing comfort soft lens was announced by the French laboratory LCS (Contact Lens Service) in early 2013. The new patented range of lenses named EyeBrid is the result of four years of research by teams at LCS. These innovative lenses need renewal every 4 months but also offer a high oxygen permeability (Dk strong). This new lens is as comfortable as a soft lens and offers the visual quality of a hard lens. 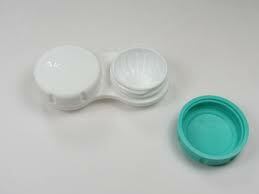 By far the most widely used contact lens for keratoconus, with the most popular RGP being the RoseK. it is essential RGP lens are fitted by an expert. Rose K was established to market the Rose K lens invented by Paul Rose, an optometrist from Hamilton, New Zealand. Paul was concerned about what could be done for patients with keratoconus – a progressive condition in which the surface of the cornea becomes cone shaped. Realising that the problem with traditional contact lenses was that they did not fit unusual corneal shapes or mimic the eye shape well, he sought to develop a contact lens that would be more comfortable for patients, be easier to fit and provide better vision to those with the condition. Paul Rose began developing the Rose K keratoconus lens in 1989. After testing 700 lenses and 12 different designs, he produced a set of 26 lenses from which all patients are fitted. A further two years was spent to perfect the lens design before it was launched in the New Zealand market. In 1995, the Rose K lens gained approval from the Federal Drug Administration (FDA) of America. Since then advances in technology have resulted in the introduction of the Rose K2 lens, the Rose K2 Irregular Cornea (IC) lens and the Rose K2 Post Graft lens designed for patients with specific conditions. These conditions include Pellucid Marginal Degeneration, Keratoglobus, Lasik Induced Ectasia and for patients who have undergone Penetrating Keratoplasty. The Rose K family of lenses are now manufactured in 13 countries, distributed in over 60 countries and have become the most frequently prescribed lenses for keratoconus in the world. RGP contact lenses can be less comfortable to wear than soft contacts, and really need expert fitting and patience. Looked after they are durable and cost effective. Because fitting a gas permeable contact lens over a cone-shaped cornea can sometimes be uncomfortable for a person with keratoconus, some eye care practitioners advocate “piggybacking” two different types of contact lenses on the same eye. For keratoconus, this method involves placing a soft contact lens, such as one made of silicone hydrogel, over the eye and then fitting a GP lens over the soft lens. This approach increases wearer comfort because the soft lens acts like a cushioning pad under the rigid GP lens. Your eye care practitioner will monitor closely the fitting of “piggyback” contact lenses to make sure enough oxygen reaches the surface of your eye, which can be a problem when two lenses are worn on the same eye. However, most modern contacts — both RGP and soft — typically have adequate oxygen permeability for a safe “piggyback” fit. Many optometrists and ophthalmologists recommend scleral contact lenses for a variety of hard-to-fit eyes, including eyes with keratoconus. The first scleral lenses were made in glass, blown and fashioned into shape by craftsmen in the 1880’s. They were also the only lens available up until the 1950s. In cases of early keratoconus, a standard RGP lens can be used. However, if the lens does not centre properly on the eye, moves excessively with blinks and causes discomfort, switching to a large-diameter scleral contact lens may solve the problem. Scleral lenses were made in rigid gas permeable (RGP) materials in 1983, and today are highly oxygen permeable. Scleral lens are designed to vault the corneal surface and rest on the less sensitive surface of the sclera, so these lenses often are more comfy for a person with keratoconus. Scleral lenses are designed to fit with little or no lens movement making them more stable on the eye, compared with traditional corneal gas permeable RGP lenses. The newest scleral lens is the ICD 16.5. With only three fitting zones, ICD™ 16.5 is easy to evaluate, consistent in lens performance and is the “go-to” lens for problematic corneas. In addition to keratoconus, scleral lenses can be used for eyes that have undergone a cornea transplant, and for people with severe dry eyes caused by conditions such as Sjogren’s syndrome, graft-versus-host disease (GVHD) and Stevens-Johnson syndrome. *Upper and lower boundaries are approximate; sizing and terminology vary among lens makers. †Manufacturers of RGP materials with FDA-approved lens designs provide the raw material to multiple labs, which produce the lenses under their own brand. Whatever lens you wear It is important to clean your contact lenses daily to maintain the highest standards of comfort and visual clarity. Each day after you remove your lenses, you must clean them prior to overnight storage. Always use the correct solution, never use tap water. Change your contact lens case regularly as bacteria will happily live in the little damp case, that could damage your eyes and cause infections. Try not to overwear your lens especially in the early days of getting used to them. If they hurt – take them out and clean them, and let your eyes rest. Try to avoid aircon and get fresh air to your eyes when you can. There are various rewetting and comfort drops available from pharmacies and your doctor. Always check that they’re suitable to use with your type of contact lens. EyePrint Pro uses the very latest 3D scanning technology. Rather than relying on standard lenses and hoping they fit the shape of your eye, it is now possible to create a 100% bespoke lens which matches the exact contour of your eye. The EyePrintPRO™ purpose is to provide the best quality of life, through vision, for patients who are extremely visually impaired and currently without alternative solutions to their corneal disease and vision irregularities. The EyePrintPRO™ is used for keratoconus, irregular astigmatism, ocular surface disease (dry eye), trauma, extreme cases of deformed eyes, pellucid marginal degeneration, chemical burns, post surgical corneas (including corneal transplants and post LASIK ectasia), pinguecula, pterygium, stem cell failure, or simply those who desire better vision and comfort. How much do these lenses cost in the US (I’ve found lots of comments about the cost in the UK)? The 14mm scleral rgp lenses for me are $400 US each and the new 16.5mm scleral rgp lenses that I am getting fit are $800 US each. Hope this helps. P’s the small 7.5mm rgp lenses are $40-$80 US each. Wow Colin. That’s expensive. I hope they work out well for you! My Jupiter sclerals were about $1500 including the lens fitting visits, some of which is covered by insurance. I have the large ones. My small rgps were $150 each. Scleral are large round lenses that vault the cornea. A Duette is a type if hybrid lens by Synergeyes. Totally different types of lenses. Comfort depends on the fit. Some people love their sclerals others not so much. It’s down to what suits your kc eye the best. I wore one rgp in ungrafted eye and a hybrid in the grafted eye before. Both brilliant. Just diagnosed with Keratoconus at 54,and am being treated for dry eyes. They’ve always been dry. It now seem to be exceedingly worse. Started Restasis almost 2 months ago and will be getting punctual plugs. I have previously had cataract surgery, these lens were suppose to optimize reading vision but made it worse than it was. I will have to go straight to contact lenses & am wondering if any can be worn as “bifocals”?